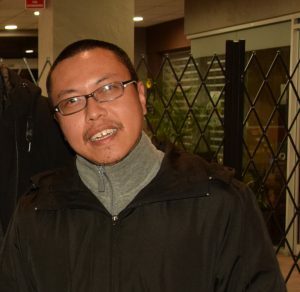 Adrian Chan thought that he would be a diocesan priest from the age of 15. This was especially so after he encountered the human condition of suffering when his bed-ridden grandma awoke him to the important questions about human life. He believes that a vocation is a permanent commitment. God-willing he is ready to undertake a life in the Archdiocesan priesthood in the future. I come from a family of four in Singapore. I have a younger brother who is married and living there, while my father is a retired school teacher and my mother is working in a Japanese home appliances manufacturer in Singapore. Born in 1975, I attended Christian Brothers Schools for primary and secondary education. Following this I enrolled at the National University of Singapore, where I studied the political sciences. I was also employed for a number of years in the computer industry. Seven years ago, I joined the Discalced Carmelites, learning philosophy at the St Francis Xavier’s Seminary Singapore, which was followed by learning theology at the Teresianum in Rome. Having completed his studies, I decided to discern for a diocesan vocation. I have been in Australia for more than a year now. Currently I am studying some units at Australian Catholic University and am attached to the parish of St Thomas the Apostle, Kambah. Last year I spent time at Holy Spirit Parish Gungahlin and also at St Patrick’s Bega. I’ve thoroughly enjoyed my time in all the parishes where I have served particularly in the schools. Having a background in the contemplative life with the Carmelites, I have introduced the children to Christian meditation and have found that they are mostly enthralled by it. I find it renewing to find so much faith among the young, mainly their eagerness to encounter God. My favourite saint in the Carmel is St Teresa of Ávila, as she was brimming with practicality. From her humour, to her governance, to her ministry, she was very much in touch with people despite the spiritual gifts she had and I love reading the book of her life. Once she fell into a stream while travelling to build new convents. She lamented that she now understood why the Lord has so few friends due to all the suffering he sends them. Since coming to Canberra I have developed a keen interest in the fortunes of the Canberra Raiders and the ACT Brumbies. Outside of this, I also consider swimming, sailing and rowing as leisure-time activities. I ask that you all keep me in your prayers as I continue my journey to priesthood.